Lady Gaga and Metallica’s Grammys Duet Sounds Much Better With Working MicsA little less stage-diving, a lot more sound. James Corden’s Adorable Parents Prove They Should Host the Grammys Next YearThey even got to do the red carpet. Grammys Producer Apologizes to Metallica for ‘Awful’ Performance MishapNo mea culpas for some other controversial Grammys happenings, though. What It’s Like to Attend the Grammys As a First-Time NomineeDance-pop duo Sofi Tukker brought us behind the scenes of their first trip to the awards show. Metallica’s Lars Ulrich Is Pretty Chill About That Whole Grammys Technical SnafuGood guy. Sufjan Stevens Has a Friendly Reminder about Racism for the Grammy AwardsStevens disagreed with Beyoncé’s loss for Album of the Year. Beyoncé and Jay Z Overruled the Grammys With Their New Song“Shining” is a miniature awards show of its own, proof that black artists set their own standards of winning and own their own records. WATCH: The Grammys Got PoliticalJames Corden kicked off the night with a jab at Donald Trump. The Highs, Lows, and Whoas of the 2017 GrammysFrom Beyoncé and Adele on down to the interminability of the show itself. A Tribe Called Quest Resist ‘President Agent Orange’ in Grammys PerformanceJoined by Anderson Paak, Tribe resisted Trump’s Muslim ban. Here Are Your 2017 Grammy WinnersWho’s collecting golden gramophones? 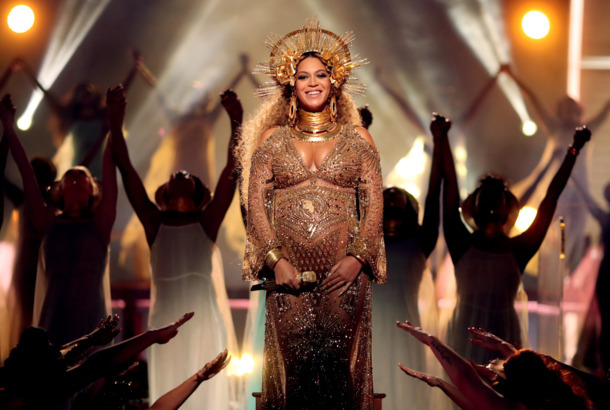 A GIF Bible of Beyoncé’s Most Glorious Grammy MomentsYou’ll never need another GIF. James Corden Stumbles Through His Grammys Monologue, on PurposeJames Corden’s trying to trick us all. At Long Last, David Bowie Has Swept The GrammysHe swept his categories. Join Vulture’s 2017 Grammys LiveblogVulture’s Rebert Browne is here to give you a play-by-play of everything that goes down. Macklemore Reportedly Didn’t Submit His Album for Grammy ConsiderationIs this another stop on his apology tour? Lady Gaga and Metallica Will Duet at the GrammysExit light. Enter Lady Gaga suspended 75 feet above the stage. Katy Perry Will Perform at the 2017 GrammysBeyoncé, the Weeknd, and Chance the Rapper also set to perform. Beyoncé Will Reportedly Perform at the 2017 GrammysHer bump might once again make an awards-show appearance.